Attending a yoga class for the first time can be slightly intimidating. As a beginner, entering a room full of barefoot adults rolling around on rubber rectangles can be rather daunting--but don’t let that stop you! In an effort to make your transition into yoga more fluid, here are 5 tips for taking your first yoga class. Keep an open mind - Like anything in life, the first step in trying something new is to approach it with an open mind and the willingness to grow. Accept that your first practice may or may not be what you expected, and be OK with that. There are many different types of postures, practices, classes, teachers and studios in the yoga community, so trust that your first class is just a sampling of all that yoga can offer. If your first experience isn’t wonderful, keep an open mind until you find what works for you and your body. Do a little bit of research - If you’re nervous about your first class, a quick scan of a studio’s website or social media pages can help answer some of your questions. You can learn more about the atmosphere of the studio, where you check in for class, where you store your belongings and what items the studio provides versus what you may want to bring. This may help you feel more natural and “in-the-know” upon your arrival. You can also learn more about the classes that are offered, the teachers and more. Ask questions - Yoga is an ancient practice that is over 5,000 years old (some researchers even argue that the practice dates back 10,000 years). Even the most advanced practitioners could be considered beginners in the context of yoga’s deep history. Point being, everyone was once new. Asking questions during or after a yoga class is not only warmly welcomed, but encouraged. Without generalizing too much, we believe it’s safe to say that most teachers have a passion for sharing yoga with others, and therefore enjoy the opportunity to help students deepen their practice. Listen to your body - Our best yoga teachers are our body. Listening to and connecting with our bodies if one of the many joys of yoga. Our practice provides us the opportunity to still our mind and instead tune into our bodies. While some yoga practices may be challenging, yoga shouldn’t hurt. If you feel pain during practice make sure to pull back and avoid the action that caused the discomfort. Either during or after class, ask a teacher or staff member to explain what may have caused the pain, how to avoid it or how to make an adjustment that feels better for your body. 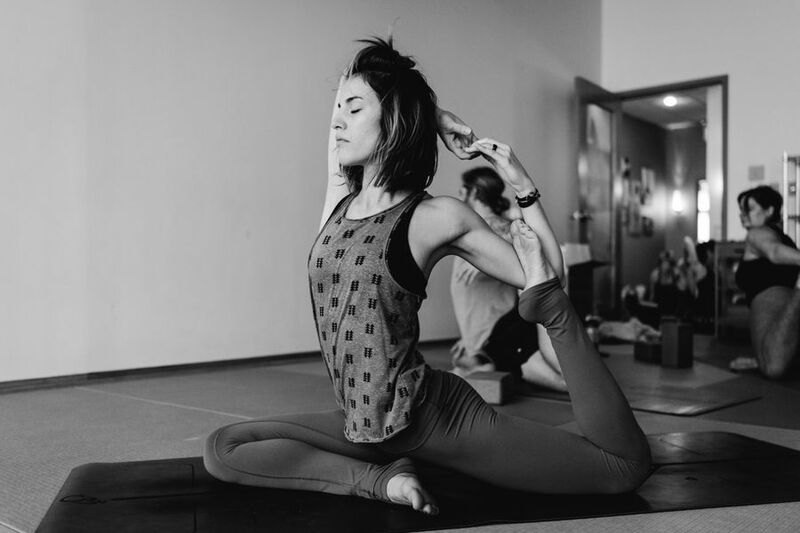 Breathe, relax and enjoy - People gravitate to yoga for many different reasons, however at the root of our intentions is our desire to feel good. Our advice to beginners; allow yourself to feel good! Try to not let your mind, your fears or hesitations about being new get in the way. If during class you feel yourself drifting to a place of uncertainty or self criticism about being new, take a deep breath and come back to your mat. Being new to yoga is a beautiful place to be. Your perspective and practice is fresh, clean and budding with possibilities for exploration. Many find that yoga is an extraordinary tool for self study and self understanding--whether it be physical, mental or more! We look forward being a part of your yoga journey and wish you the best as you embark down this path of health and wellness.